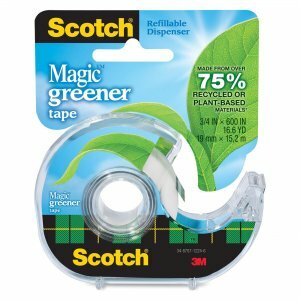 Eco-friendly Scotch Magic Tape is made from more than 75 percent renewable, plant-based materials. Photo-safe tape disappears on paper and won't show on copies. Pull off the roll smoothly and cut easily. Easy-to-handle tape resists splitting and tearing. Tape also resists yellowing and drying out. You can write on the tape with a pen, pencil or marker. Each roll of tape comes in a refillable, clear plastic dispenser.